We thought the Transformer 3 Pro had the potential to transform the expectation of the 2-in-1 market. But, inadvertently, it's thrown the door wide open to all of its more moderate competition. Shame. The 2-in-1 market has seemingly settled on a solution: create devices that ape the Microsoft Surface. Acer has done it. Lenovo, too. And now it's Asus's turn, with the Transformer 3 Pro. But the Taiwanese company has been clever about its angle; the Pro in the name is reflected in the product's specification, with the top-spec Transformer squeezing in an Intel Core i7 processor, 8GB RAM, 256GB SSD, and even featuring clever expandable discrete graphics via the ROG XG Station 2 (sold separately). The Transformer 3 Pro also comes with both a decent keyboard and stylus included, unlike the Microsoft Surface. But it's also a pricey device, at £1,399 (or £899 for the Intel Core i5 model). So is it as truly “Pro” as it proclaims and worth the cash? When we first saw the Transformer 3 Pro on stand at Computex earlier in the year, it was a shoo-in for a Surface-beater. But actually living with a product makes a real difference. Having duly carted the Transformer 3 Pro around with us in a bag, and used it as our day-to-day work laptop replacement, we've come to think differently. The specification components are there, sure, but there are a combination of subtle weaknesses that breakdown the device's overall capability. First up, that shiny paint job. We rather like that almost trademark Asus silver-purple appearance. But it's not a very tough coat - it scuffs too easily. We've carried the Transformer 3 Pro around in the rear soft pouch of a backpack and after just two days the edges were scuffed. The back somehow chipped too - and we've not been rough with this device whatsoever. Visually, the Transformer 3 Pro otherwise has its Surface factor on point. At almost exactly the size of an A4 sheet of paper, the 12.6-inch Asus is ever so slightly larger than the 12.3-inch Surface Pro 4 - but not by much. In the hand they feel roughly identical, though, as the Asus is nigh-on the same thickness as the Surface, at 8.35mm (ok, so the Surface is 0.05mm thicker, but you won't know it). The rear hinge, which can fold down to a 155-degree angle, can be infinitely positioned and hold its position firmly. It's got a great, smooth action and works a treat - just as we would expect of a device at this price point. Which is a bit of a sticking point. 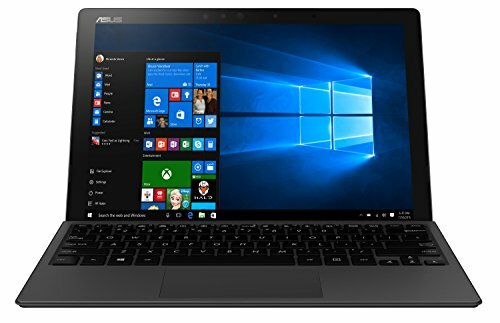 Like-for-like, the Asus is actually £100 more than its equivalent i7 Surface Pro 4 competitor. Add a Microsoft keyboard and, ok, it's perhaps £10 less overall. But we'd pay the extra tenner to avoid scuffs and scrapes. Asus hasn't been especially hardened on the price front, whereas Acer, with its liquid-cooled Switch Alpha 12, certainly has. Asus has definitely gone pro in the Transformer 3 Pro. It runs smooth as butter, but that's no surprise given the power under the hood. In some respects, in a form factor of this size, such a powerhouse doesn't make much sense: because it adversely affects battery life. Indeed, the Transformer 3 Pro has the weakest battery life of any 2-in-1 that we've tested recently. And we've held a strong stance at pointing this out with any other makers: the Huawei MateBook, for example, lasts longer from a much slimmer form factor. The Surface Pro 4 will give almost 50 per cent more use in our experience too. Our first Transformer 3 Pro charge dipped to just 50 per cent charge after two hours. Ah, but it's an Intel Core i7, so surely we were pushing it hard? Not at all: with Battery Saver on, screen brightness set to 50 per cent, Wi-Fi connected, and Microsoft Edge open with between two and eight tabs running maximum, that was all we were working with. The device has yo-yoed telling us we've had anywhere between six and two hours use from a full charge, but on the approach to four hours of use it was approaching battery depletion. The fan even kicks in just with these limited applications open. Yikes. Fortunately it can fast charge - which will take around two to three hours from dead to full, but can hit 60 per cent in an hour when in standby mode. But when you really want to pull on that Intel Core i7 processor when on-the-go, it'll further smash the battery life. With Battery Saver off and screen brightness set to 100 per cent, however, don't expect longevity beyond three hours - less if you're doing anything more taxing. Now this is obviously a far cry from what Asus claims the Transformer 3 Pro is capable (“all-day performance”), but we've been assured this sample is a consumer-ready device. Running video in the background might be less impact on the battery, but that's not the way laptops are typically used. Just to make sure we ran a YouTube stream, full screen, with no other tabs or applications running, brightness set to 100 per cent, sound to 25 per cent, and squeezed just under four hours out of the Pro before it called it a day. Plug it in, however, and there's nothing to worry about. So as a laptop or desktop replacement that you can plug in anywhere you please around the house or office, the Transformer 3 Pro can make the most of its powerful innards. Another factor that may affect the battery life the Transformer 3 Pro's screen. Because it's super-high resolution (at 2,880 x 1,920 pixels) and looks fantastic. But pixels mean power. With a huge colour gamut (121 per cent of sRGB) the screen choice looks fantastically punchy, with ample viewing angles to always present a sharp, colorful and contrasty image. It's impressive. It's also the wearer of a glossy coat. Which means you'll almost always be looking at your own annoying reflection. Furthermore, as battery life is so restricted, we've been attempting to use the device in its lower brightness settings (the 25% or 50% options within Windows 10's side panel) which further highlights this reflectivity. The Transformer 3 Pro is, in a sense, the victim of its own doing. Great resolution, colours and viewing angles are hindered by reflections or, as a result of upping brightness to negate this, even more limited battery life. It is a quality screen though. We've long called out the Microsoft Surface for charging extra for its keyboard. That's not the case with the Asus - which we think is great. The keyboard that comes included is a really decent offering too. It's solid, so there's no flex, while attaching it to the main screen panel is just a case of clipping it to the magnetic connector. Nice and simple, just how we like it. There's no waiting around for a connection to be made either - it's instant. The keys of the QWERTY pad have slightly odd-looking fonts, but their travel and firmness makes for a great typing experience. They're back-lit too, for brightness in those darker conditions. A fully flat position or slightly raised position - by folding the top edge of the ‘board back into the screen, just like with the Surface - makes for a comfortable experience as to your preference. The trackpad, too, has a surface that ensures your finger will glide along, with great feel and responsiveness. We've had some issues with gestures occasionally not working, however, and can't work out why. The reality, however, is somewhat different: the Transformer 3 Pro is the victim of its own power, delivering poor battery life that undoes much of its portable purpose. The inclusion of keyboard and stylus is a great addition - but at an overall price point that doesn't notably undercut the established Surface Pro 4, we're left scratching our heads at exactly how Asus expects to outsmart Microsoft here. Perhaps the lower-power Intel Core i5 model makes more sense.